Home News Events Archie Comics heads to Baltimore Comic-Con 2016 with Must-See Panels and Creator Signings! Archie Comics heads to Baltimore Comic-Con 2016 with Must-See Panels and Creator Signings! Archie and the gang are taking over Baltimore Comic-Con this weekend and you’re invited along! In addition to being the focus of this year’s Baltimore Comic-Con Yearbook featuring artwork from the industry’s best and brightest, Archie Comics will be hosting two must-see panels and multiple signing events with top writers and artists throughout the weekend. The fun starts on Friday with the Archie Comics: Baltimore Comic-Con Yearbook Panel featuring artists from across the comic book industry sharing stories about how Archie has influenced their lives and careers. The fun continues on Saturday with the Archie Comics: 75 Years of Storytelling panel featuring writers and artists from your favorite series as they discuss what fans can expect next for Archie and the gang. For more information about Baltimore Comic Con, visit the official website. 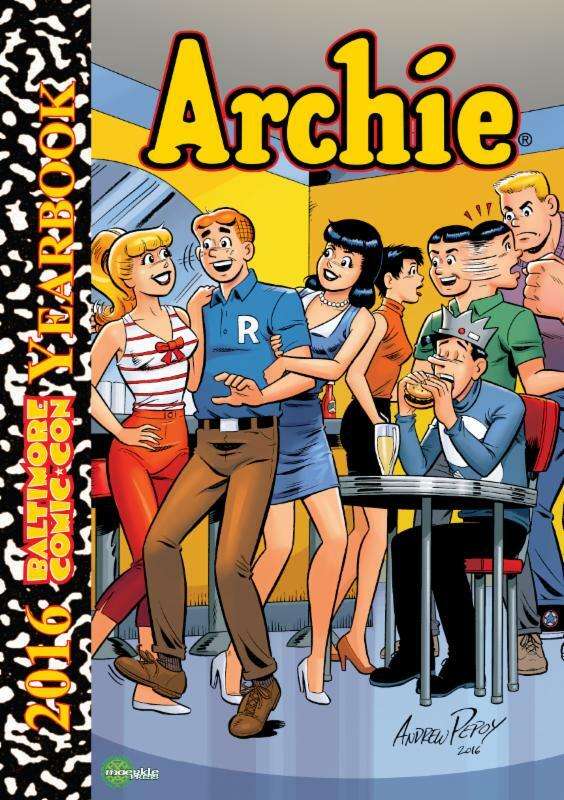 The Archie Comics: Baltimore Comic-Con Yearbook Panel! Artists from across the industry have come together to put their spin on the Archie characters for this year’s Baltimore Comic-Con Yearbook! Learn about how Archie and the gang have impacted their lives and why everyone’s favorite teens are flexible enough to be drawn in any style! Join designer Thom Zahley and artists Andrew Pepoy, Brandon Peterson, Steve Conley, Barry Kitson, and Archie Comics President Mike Pellerito for this Archie art showcase panel! Celebrate the 75th anniversary of Archie and the gang in this must-see panel featuring writers and artists from your favorite Archie Comics! Join Archie Comics President Mike Pellerito, ARCHIE writer Mark Waid, BETTY & VERONICA writer/artist Adam Hughes, and AFTERLIFE WITH ARCHIE artist Francesco Francavilla for a look back on what has made Archie great for 75 years and a look ahead at what’s coming next! baltimore comic con, conventions. Bookmark.